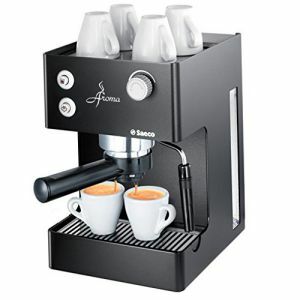 Espresso machines come in all price ranges. If you have the budget for it, you can get a real fancy one that would make a professional barista quite happy. However, you can also get decent mid to low range options for home use. This guide will help you find the best espresso machine under $300. If you want espresso coffee quickly, using capsule espresso modules in compatible machines will give you a fool proof cup of brew everytime. However, pod espresso makers don’t let you use your own grind so you can’t try a special gourmet blend that you may have come across and liked somewhere else. You also can’t play around much with the brew strength and depth of flavor. The machine recognizes specific brands of capsules and pumps out the exact pre-programmed amount of water required for that blend, so it is an automatic machine. You may be able to pre-program this setting first. A semi-automatic is more common for loose grounds because it allows you to control the pressure bar, so you have more control over quantity of water for strength of brew and flavor when you use different espresso blends. Amazon is the place to go for the largest range of espresso makers under $300. So what are the best espresso machines under $300? Read on to find out your options for the pod kind as well as loose grounds. If these are still beyond your budget, we will soon have some options that cost below $200. If you want a single serve espresso machine that brews from pods, you have two good brand options and we’ll cover the best of those here. But if you want a few more choices, take a look at our full choice of espresso machines that are pod compatible. You can get a Nespresso or Illy if you’re looking for the best espresso machine under 300 dollars along with convenience. With both these, you can purchase a wide variety of coffee blend pods and even have them delivered to your home on a subscription basis. While these are particularly good for espresso, you can also get pod coffee machines for regular coffee. The Pixie is a similar but smaller version of the Citiz and is the smallest in the Nespresso line, but works every bit as well. This portable Nespresso Pixie espresso maker can make one cup effortlessly. This is a great no fuss way to get a great brewed cup of espresso, as it uses Nespresso coffee capsules that lets you choose the flavor of your coffee. You just pop in a capsule, fill up the built in 24 ounce water tank, and select either espresso or lungo for your desired coffee quantity which you can re-program if you want to. The water preheats in only 30 seconds and it has a 19 bar high pressure pump. With programmable buttons, auto power-off mode and backlight indicators to detect water level, the Pixie from Nespresso is truly a blessing for espresso aficionados who don’t want to fuss too much with the settings. The added benefit comes from the milk frother, which can be used to add hot or cold milk froth to your brew for a delicious cappuccino or latte. At this price, it may be the best automatic espresso machine for your needs. Although the water tank is small, it doesn’t really affect the functioning of the machine. In fact, it forces you to use fresh water to make your morning brew and this has a profound effect on the taste and flavor of the espresso. It also has a small compartment for 10 spent capsules, but don’t worry, it is easy to empty out the compartment. The cup platform can be folded out of the way if you want. If you’d prefer a larger water tank while retaining all the other features, consider the Nespresso Citiz for just a few dollars more. The size of this machine allows easy storage and there is space to store the power cord without a problem. It is also very lightweight, which means you can take it anywhere you have water and electricity. It does not drip at all once it finishes dispensing your brew so it really is mess free. If you don’t want to be limited to just espresso, cappuccinos or lattes but would also like a good old cup of regular coffee now and then, you should try the Nespresso Vertuoline with Aeroccino frother. With this machine you can choose to brew an espresso or a coffee and add hot or cold frothy milk, all for under $300. It can recognize two sizes of capsules – the large for coffee and the small for espresso, and can read the blend specific code on the lid for specific parameter brewing using Centrifusion technology to give you crema rich brew. The catch is that you can only use Nespresso Vertuoline capsules, as it won’t work with the original line, however they are easily available online and at select stores. Capsules are easy to insert and they just as easily get ejected into a used capsule container that holds up to 20 of the small ones or 13 of the large ones. The water tank comes with a 40 oz capacity and heat up takes just 25 seconds. One criticism comes from those who like their coffee piping hot but find that this machine does not give them that. A 10 second nuke in the microwave is enough to bring it to a higher temperature. Illy gives you a single serve espresso maker called Illy Francis Francis Y1.1 that will delight your taste buds with the perfect cup of espresso and you can choose from three chic colors too. It uses Illy Lungo and Espresso iperEspresso capsules that come in a great variety of blends that makes it perfect for the busy exec or working mom who loves a great espresso but doesn’t have time or want to stand in line waiting at Starbucks. You have a coffee brewing system that uses a variety of your favorite blends from Dark roasted, Ethiopian, or decaf if that is your preference. It is simple to operate using touchpad controls, with an automatic shutoff and auto volume stop for two programmable volume settings for espresso or lungo. It also has a built-in descaling function to remove calcium build up. Construction is aluminum with an adjustable cup drip tray for any size of cup, a glass warming plate that keeps your cup warm after brewing, and a 23.7 ounce water tank. The Illy capsule system is unique in that there is a two stage extraction process involved. During the first stage, water enters the capsule to saturate the coffee for maximum flavour extraction. Then still within the capsule, the coffee exits through a valve to complete the quality of brew along with a rich and thick crema while never coming in contact with the machine. This is mess-free at its finest! Most aficionados say that Illy blends are far superior to Kcups, Nespresso and Starbucks but you pay a price for this, as the capsules are more expensive. However, it is still a lot cheaper than going to a café for your espresso. The fact that there is no mess whatsoever makes it a good buy. Note that the coffee warmer is only useful if you leave the machine on all day. This is impractical for some users although it is a nice bonus feature if you want your coffee to stay hot all the way to the last drop. If you ant to play around with strength and flavor of brew, you have to use loose grounds that you grind yourself or are store bought. These machines have a portafilter that you fill with the grounds and sometimes have to tamp down to get the right quantity in a tightly packed space. This is another espresso machine that takes up very little space, except this one allows you to use your own espresso grounds. Nice to have if you aren’t a fan of the Nespressos, Illys, Kcups, etc. The De’longhi Dedica gives you your shot in less than 40 seconds because of the thermoblock heating technology and self-priming to have it ready at all times. With 15 bar pressure and the auto-flow stop feature, you are certain of the perfect single or double shot each time, and its cappuccino frother gives you café quality foam. You have a choice of single shot, double shot or an espresso pod each time because of its included 3-in-1 filter. The included tamper is meant to be used for the former two. Additional features include an illuminated control panel and a built-in cup warmer to heat your glasses or cups before using them for shots. Some users say that while an espresso comes out hot, the use of the frother makes their cappuccinos and lattes cold. This is solved by preheating the milk before using the frother. Another complaint is that the machine leaks but that is usually because the water tank is not fitted properly. Pull two shots at the same time with this unit. With the Philips Saeco Aroma Espresso Machine you get the ability to choose between using pre-ground espresso or E.S.E (Easy Serving Espresso) compatible pods because of the included adapter. The pressurized portafilter does away with the need to tamp the grounds and the powerful 15 bars of pressure extracts maximum flavour from the coffee while producing a rich crema. Even though it boasts a large 85 oz water tank, it is quite a compact unit and it can be refilled by either pouring water from the top after removing the lid or can be taken to the sink. It comes with a frothing wand that easily swivels to froth your milk to your desired temperature. A cup warming surface on top lets you warm up your drinking cups before pulling a shot to ensure your espresso is nice and hot. Because it is such a compact unit, the steam wand is not easy to use with a tall pitcher unless the unit is at the edge of the countertop with the pitcher held below. The portafilter can create a bit of a mess because of the pressurizing technology, so you’ll have to clean up after each use. If this is inconvenient, you can switch to using pods. The drip tray is easily removable for accommodating larger cups or for cleaning.